What Is a Liquor or Distilled Spirit? The copper pot stills at Maker's Mark Bourbon Whiskey Distillery are the second distilling vessel for the bourbon. A liquor, or distilled spirit, is an alcoholic beverage that is distilled rather than fermented like beer and wine. Distilled spirits include brandy, gin, rum, tequila, whiskey, and vodka, as well as a variety of flavored liqueurs. Liquors are the primary ingredients used to make cocktails. The majority of mixed drink recipes require at least one liquor, so whether you call it a liquor, a spirit, or simply booze, these bottles are essential in the bar. While a liquor's definition differentiates it as "distilled rather than fermented," every distilled spirit begins with the fermentation of a base ingredient. During this process, yeast is added to a wort, which is a mixture of water and a mash containing a fermentable organic substance. As the yeast works its magic, the base ingredient's sugars are converted into alcohol. A single grain or combination of grains, such as corn, wheat, or rye, are used to create spirits like whiskey, vodka, and gin. 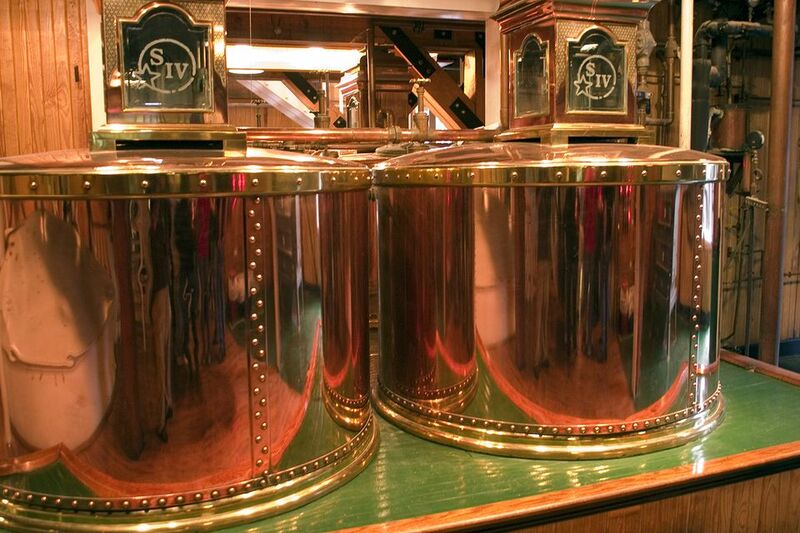 They are also used for neutral grain spirits that form the base of many liqueurs. In the whiskey world, the term mashbill is often used to refer to a distiller's particular mixture of grains to create a custom recipe. Molasses is fermented for rum, while pure sugar cane juice makes cachaça. Tequila and mezcal begin with the extracted juices of the agave plant. Starting out like wine, brandy is made from fermented fruit juices. This is typically grapes, though apples, apricots, cherries, and other fruits can be used as well. Some vodkas are distilled from fermented potatoes. Once fermented, the liquid is distilled through either a column still or a pot still. The still's heat forces the alcohol in the fermented liquid to evaporate—alcohol has a lower boiling point than water. The water is left behind, but the alcohol vapor is forced into the next stage of the still, such as a series of coils or another pot, depending on the setup. When the vapor is cooled, it condenses and creates a concentrated alcohol liquid that is so strong—high alcohol by volume (ABV), or proof—that it is undrinkable. At the end of distillation, the strong alcohol is collected. It may then be filtered, aged, or flavored (or a combination of any or all three) and diluted with water to the bottling strength. The exact process depends on the type of liquor being made—for instance, gin is flavored within the still—and each distiller's preferred method for any of the distillation steps. Of all the liquors available today, there are six styles that form the base for almost every drink you can mix up. These are commonly referred to as base liquors and each has its own unique characteristics. Many are bottled at a standard 40 percent ABV (80 proof), though some are stronger, reaching as high as 151 proof. The base liquors are brandy, gin, rum, tequila, vodka, and whiskey. Within each of these categories are a number of styles, such as London dry gin, Cognac, and reposado tequila, which are further defined by the various production methods employed. Whiskey is one of the most complicated categories because of differentiations like bourbon, Irish whiskey, rye whiskey, scotch, etc. Liqueurs are sweetened distilled spirits that are typically made from one of the six base liquors or a neutral grain spirit. They tend to be lower-proof, bottled around 15 percent to 30 percent ABV (30 proof to 60 proof). However, that's not always the case, as seen with popular orange liqueurs; both Cointreau and Grand Marnier are 80 proof. This is where flavors really come into play in the bar. Liqueurs can feature a single flavor, such as apple, strawberry, peach, or melon, or they may be a blend of ingredients. Popular liqueurs like Benedictine, Chartreuse, Drambuie, and Hpnotiq use a variety of herbs, spices, botanicals, and fruits to create their signature flavors. Many of these recipes are kept secret, though some companies reveal at least a partial ingredient list. Distilled spirits can be a bit more complicated. Some cannot be easily classified as one of the base liquors or as a liqueur. Absinthe and VeeV Acai Spirit are perfect examples of these. Although they may have characteristics of one of the base spirits, they are also flavored like liqueurs but are not sweetened. Since there are no other labels to completely define these "oddities," they are often simply referred to as spirits. Other exceptions in the bar include the long list of aperitifs and digestifs. Some of these are fortified wines and some include distilled spirits. Others could be classified as liqueurs, while still others only fit under the labels aperitif or digestif because they are unique unto themselves. One such case is vermouth, which is commonly found in the liqueur section of a bar's stock because it's essential for martinis, Manhattans, and the like. While that makes it easily mistaken for a liquor, vermouth is a fortified wine. Though some fortified wines are blended with brandy or another distilled spirit, they are not considered to be liquors under any formal definitions. When classifying any alcoholic beverage, it is best to take each case individually. The market is so diverse that it's hard to know what's what. Whenever you're in doubt (or need to settle some debate at the bar), read the label.